Welcome to Upper Key Stage 2. 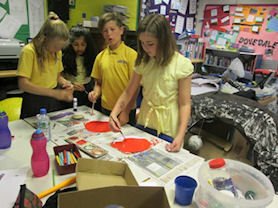 The children in Year 5 and 6 have a wide range of clubs and activities that they can enjoy. There are many more responsibilities that the children can take on in Years 5 and 6 and all children have the chance to audition for an acting part in the Christmas Production. The children in Year 5 follow the new National Curriculum whist the Year 6 children will be following the original curriculum for 2014/15. Children will continue to cover a range of topic based work including Vicious Vikings! 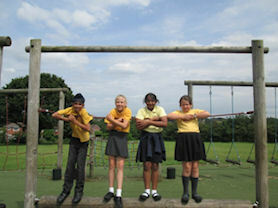 As the children continue further up the school their responsibilities increase. In Year 5 children have the opportunity to become a Librarian and also a Lunch Time Helper. During the summer term of Year 5, the children begin to work towards the arrival of their new Reception Buddies. Year 5 also offers all children the chance to go on our school residential visit which is a week away in Snowdonia. 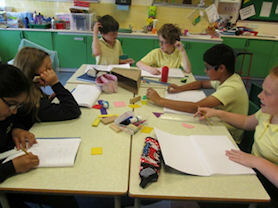 As the children progress into Year 6 they start working towards their end of primary school SATs exams. As well as this they cover a full range of subjects and enjoy a variety of enrichment activities. Children have the opportunity to nominate themselves to be a 'House Captain' – these positions are awarded by the rest of the children in Key Stage 2. A Head Girl and Head Boy are also elected by the school staff. Year 6 children support their Reception Buddies throughout the year and have various opportunities to work with their Buddies and build a lasting relationship. They participate in a number of school visits, including Dovedale, Cadbury World and an end of year reward to Drayton Manor Theme Park. During Year 6 children can join the Sutton Coldfield Rotary Scheme, where they complete a number of tasks to earn the Rotary Award. 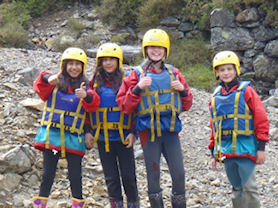 Year 5 enjoying water sports at Ogwen Cottage – Snowdonia. 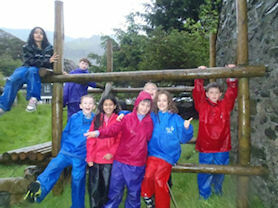 There were lots of wet activities at Ogwen. 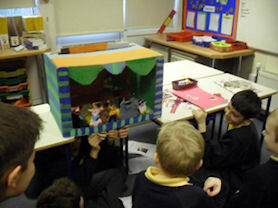 Year 6 rehearsing their puppet shows for their Reception Buddies. Year 6 Art and Design work. Year 5 working together on Geometry. Having fun on the Key Stage 2 adventure playground.